Dream Vacation from Montlick & Associates! 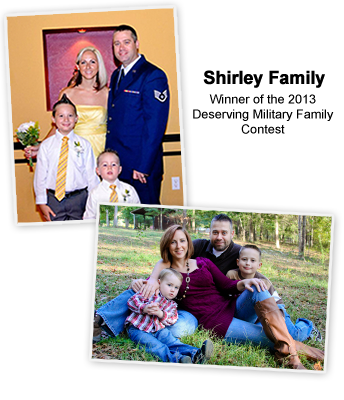 The Family's Nomination Letter: Tsgt (USAF) Patrick Shirley of the 283rd Combat Comm. has been deployed since January 4, 2013. While deployed, the Shirley family has maintained a strong faith and Patrick has volunteered in Afghanistan to teach the Afghanis English. To help keep morale high, Patrick developed (with members of his unit) “Shirley's Shindand Speedway” to allow his unit to race remote control cars. The amount of joy this has brought to a very mentally and physically exhausting deployment is amazing! Especially when the soldiers share videos on YouTube that the families back in Georgia can watch too. Tsgt Shirley's wife, Mandy, has taken on being mom and dad to their sons, ages 9 and 4, while also being active in leading the Family Readiness Group (FRG) and bonding with other families in Patrick's unit. Even with thousands of miles between them Mandy and Patrick have worked hard to maintain a sense of normalcy for their family. Patrick still provides discipline and motivation via Skype chats and takes pride in being a "willing participant in God's plan" for his life and family. WSB-TV chose the top 5 finalists from entries submitted and then the public voted for the winner on wsbtv.com. Montlick & Associates is happy to provide the Shirley Family with a much-deserved paid vacation! My sister, Jennifer, is married to a soldier and they have two very beautiful, special children, Galilea, 6, and Henry, 4. After Henry was born in 2009 and needed emergency heart surgery, my brother in law decided to join the army to provide financial stability and healthcare for the family. 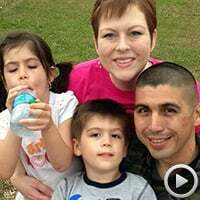 After he joined, he and Jennifer and their two children were stationed in Germany and Antonio was deployed to Afghanistan for a year. Towards the end of his deployment, my sister found out that my niece, Galilea, would need brain surgery so Antonio returned from Afghanistan to be with them for the surgery. Two days after his return, my sister became very ill and was diagnosed with Acute Leukemia. The whole family was brought back to the USA and my sister began treatment for Leukemia while my niece went through two brain surgeries. My brother in law has not only fought for the country, but he has been so supportive of my sister, staying be her side and caring for their home and children while she has been sick, gone through chemo and a Bone Marrow Transplant. They are currently living in Georgia because my sister had her transplant at Northside Hospital Blood and Marrow Transplant Group. This family has gone through so much in the past few years and they have only become stronger in their family, in their love and in their faith. Both parents are Air Force Vets. 2 years ago, John Knight Jr. was hurt on the day he was headed home from Afghanistan, a mortar hit his building which resulted in injury. John suffered a concussion, shrapnel wounds and had immediate surgery to remove the big pieces. In the mean time, his wife got the phone call at work (Dobbins Air Reserve Base, Marietta, GA). John was an E-6 and served as a Fireman. A purple heart recipient who now attends school, suffers from PTSD, TBI, and wounds due to the shrapnel, is doing well but deserves nothing but a vacation! It has been a very hard, long, and stressful 2 years for him but he is doing great despite all of his conditions. 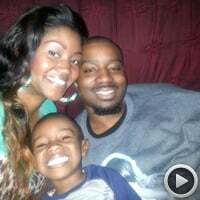 Having his 3 year old son around and wife has/is helping him out tremendously! 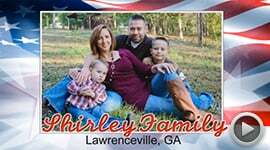 I nominate the Shirley Family of Lawrenceville, GA. Tsgt (USAF) Patrick Shirley of the 283rd Combat Comm. has been deployed since January 4th 2013. He's missed his every holiday this year, including his sons' birthdays but even while away has tried to make things special for them while he's so far away. The above picture is of him reading the boys a book via video while deployed--a most precious moment for them both. While deployed, The Shirley family has maintained a strong faith and Patrick has volunteered in Afghanistan to teach the Afghanis English. To help keep morale high, he developed (with members of his unit) Shirley's Shindand Speedway to race remote control cars. The amount of joy this has brought to a very mentally and physically exhausting is amazing! Especially when they share videos on YouTube and the families back in Georgia can watch too. Meanwhile, his wife Mandy has taken on being mom and dad to their sons, ages 9 and 4, while also being active in leading the family Readiness Group (FRG) and bonding with other families in Patrick's unit. The friendships and bonds formed through this experience with outlast any deployment and have lasting impacts on the lives of these families. Finally, even with thousands of miles between them Mandy and Patrick have worked hard to maintain a sense of normalcy for their family. Patrick still provides discipline and motivation via Skype chats and takes pride in being a "willing participant in God's plan" for his life and family. This family is a daily inspiration to me, and a reminder of what matters most in life: family! I would like to nominate the Smedley family. Demetrius serves as a Chief Warrant Officer in the Army and is now deployed on his fourth tour to Afghanistan. 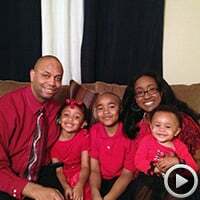 His wife, Sherita, is holding the family together while she is going to school getting her doctorate and working online. She also is volunteering with her husband’s FRG (family readiness group) unit as the coordinator for the Walk to Afghanistan program. The program tracks the miles the wives walk in order to show they are “walking” to Afghanistan to meet their husband. Sherita has gotten the whole family to participate and walks over 20 miles a week. Demetrius while deployed has often helped other soldiers by tutoring math to help them with getting their bachelors. This amazing family has moved over 5 times in the last 10 years, but has managed to keep a loving atmosphere for their three children ages 9, 6, and 2. The family is big on quality and not quantity when spending family time together. Sherita sends care packages to Demetrius and often Skype’s with him so that he can remain active in the children’s lives. Demetrius and Sherita are always busy working with little time for themselves or much time to have family vacations due to the moves and deployments. I know this family would enjoy some family time and a much needed break from their busy schedules. My name is Sgt Turner, Chad. I am Currently Medically retired from the Army due to Medical conditions due to combat. I did 4 tours over seas. I was with the Ga Army National Guard. 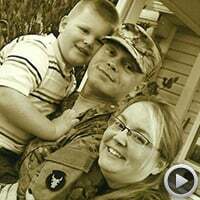 When me and my wife had our son I was deployed to Iraq for my first tour. While I was gone we found out that he is High Functioning Autistic. So, When I got back from my first tour, I was home for a while and me and my wife decided that I needed to do something cause we needed insurance for our son. So that we could make sure that he got all of the help that he needed. I volunteered for 3 tours after my first due to financial reasons especially for the insurance reasons for our son. We have never ever been on a Vacation cause we could not afford it. I would love to take my wife and son to Walt Disney World in Florida due to they have never been. Me and my wife have been married for 8 yrs going on 9. Please Please chose us for this. It would be a true blessing for me and my wife Espeically for our son. He would love it... God Bless!!! !